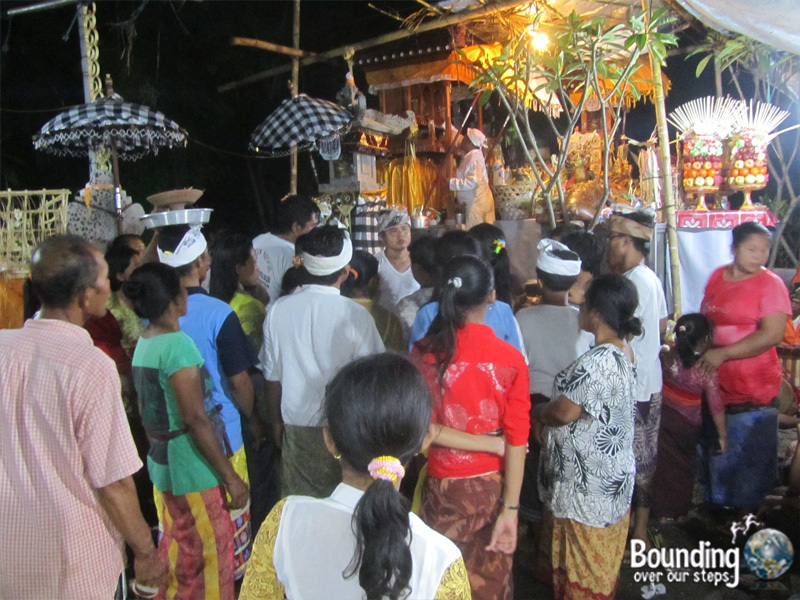 After sharing with our guest house owner, Taruna, that we not only enjoyed gamelan (bronze Balinese orchestra), but we have also played, he invited us to a trance dance ceremony to bless a new village temple that was to be performed that night in the village. Perhaps not sure if we were aware of the rare opportunity this was, he continued, “You will not find this on any stage or at any show. It is private for this village.” It felt like he was saying that this was the real deal and my excitement grew. The sudden recollection of a video I saw about this ceremony way back in college in my Gamelan and Music of the World courses led me to warn Mindy that “things might get crazy.” As it turned out, I was right to do so, because we saw another foreign couple there who, clearly having had no idea what they were getting into, had a perpetual look of horror on their faces. Per instruction, we waited with baited breath in our room (charging the camera batteries, of course!) for Taruna to fetch us. Around 10:00pm, we followed him down a dark, narrow dirt road with a couple snarling dogs along the way. It was quiet until the music started, only a short distance away, and so we picked up the pace. Just ahead on the right, we came upon quite a scene. With easily more than 50 people there, ranging in age from babies to the elderly, it would appear that the entire village had shown up. What first caught our attention was the use of swords, called “kris” in Balinese. At first, women danced with them and after slipping into a trance, began pushing the swords into their upper chest area, close to the armpit. Members of the community seemed designated (or perhaps were self-appointed) to ensure the safety of those entranced. I remember thinking how much trust someone would have to have to be willing to put themselves in such a vulnerable state. We thought we had seen the most shocking events of the evening, when suddenly an ancestor of the village embodied one of the males in attendance. 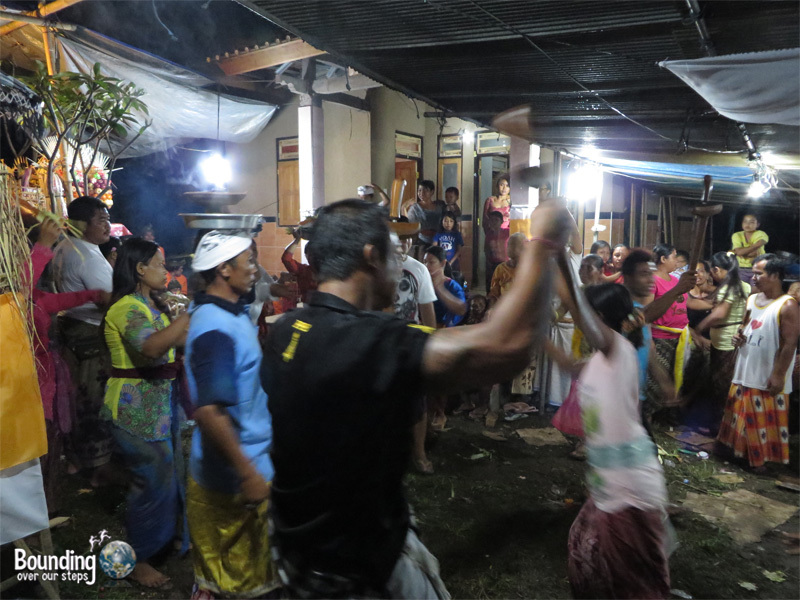 As Taruna explained to us after the ceremony, spirits of ancestors enter the bodies of villagers in a trance and sometimes communicate their presence. The sudden transformation of the young man we witnessed surprised us due to his violent nature, as he grabbed a woman, ripped the tie out of her hair and angrily shook her. The young man also began walking man with a limp and the villagers seemed to know who had shown up. The music stopped and the villagers seemed to enter a more quiet time, when they asked the ancestors for advice on issues they were having. It was clear that everyone took this part of the ceremony very seriously, hanging off every word. The spirit in the young man asked for a coffee and a cigarette so people passed these to him. The coffee was rejected because it was the wrong kind. Some of the family then remembered that this ancestor liked coffee with milk and ran out to the store to get some. Water is ceremoniously splashed on those in a trance to revive them. The man washed his face, took a drink and went to sit down. He looked around getting his bearings, having no idea what had just happened. He would have to ask if he wanted to know. Upon the completion of the ceremony Taruna told us of a time when a woman in a trance once drank an entire bottle of arak (Balinese whiskey) because the ancestor who had entered her had been an alcoholic. When she came out of the trance, she was not even a little drunk, the ancestor having taken the effects of the alcohol with him. Later, when we got to Ubud, considered the culture capital of Bali, we saw the “trance dance” listed as a performance on several stages. The description read that the dancers walk on hot coals demonstrating their trance-like state. This ooh and aah performance couldn’t have been further from the intimate village ceremony we had witnessed. We send a very heartfelt thank you to Taruna, his family and the villagers of Pemuteran. This seems fun! Balinese know how to have fun for sure. 🙂 Good people. Wow you two, that is something really special that you witnessed. We would have loved to experience it. We can’t get to the video as we are in Turkey (booooooo) but we’ll be sure to check it out when we leave! Sounds a bit scary to me. What if the spirit refuses to leave? Crazy practice, but definitely something unique.